Remote work is commonplace, especially among development teams and startups. The effects of skipping the commute and controlling your workspace are usually reflected in a productivity boost and a better work-life balance, but these advantages do come with some drawbacks. Team dynamics are complicated enough even when everyone can grab lunch together. It’s often the “relationship” side of your team that will need some different techniques in a remote setting. If you’re a manager, building strong relationships with your direct reports is paramount for both their success and yours. 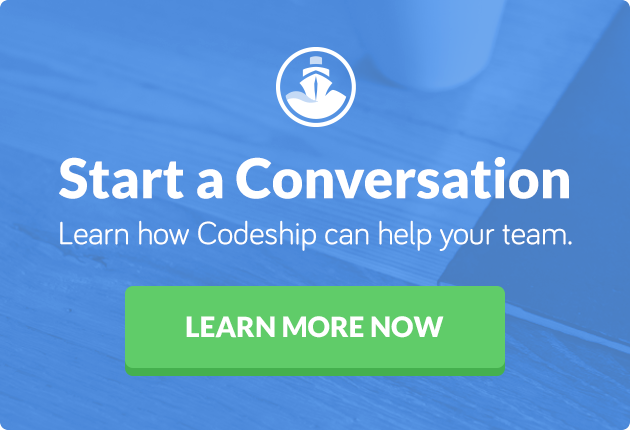 At Codeship, I manage a fully remote team, and our employees are scattered across Europe and North America. I found that much of the usual advice for 1-1s — hold them biweekly or monthly, make it a walk-and-talk, keep it tech-free — just doesn’t work for remote teams. Our set of constraints necessarily leads to some interesting solutions. So don’t let the limitations of wifi bandwidth, your video camera, and your laptop screen get you down. Here are four tips for leading successful 1-1s with your remote teams. There’s no substitute for sitting down next to someone over a coffee, but video call is a pretty good approximation! Facial expressions and nonverbal cues can give you the chance to respond to or correct something before it gets out of control. It’s easy enough to hide emotions over a voice call (we’ve all seen Ferris Bueller’s Day Off, right? ), but video gives a deeper window into what’s really going on with someone. Video also helps humanize your team. When teams interact with each other mainly over text, it’s sometimes hard to forget there’s a human on the other end of that screen. Simply seeing the faces of our team goes a long way for shared understanding, cooperation, and empathy. It also avoids miscommunications when talking about more contentious subjects. If someone tells me they’re disappointed in the outcome of a project and that we need to correct course, it’s much easier to be at ease if I can see their calm expression on video. It’s sometimes hard to assume best intentions without a face to back it up. While lots of remote employees love that they don’t have to commute, it doesn’t mean that they also don’t miss the social aspects of working in an office. Some remote employees still crave those in-person interactions and feel disconnected from their team if they don’t share some non-transactional human experiences on a regular basis. While not a perfect replacement for the watercooler, a video call can help strengthen relationships and build camaraderie by being able to see each others’ faces. I’ve worked on teams where we had a “no video” policy, which sometimes helped us feel more at ease with spontaneous calls or pairing sessions (after all, it might easy to throw on an office hoodie for some of my coworkers, but my grooming routine is a bit more complex, so spontaneous video calls aren’t really my thing!). Our engineering team at Codeship uses the opposite policy, where video is an expectation. It might mean that we need a bit more lead time for calls, but the quality of the communication is significantly better with video on. I don’t mean to suggest that video can completely replace the need for in-person meetings. Relationships grow stronger when people have a chance to interact in person, so team meetings and retreats are crucial. But once you have a solid foundation for a relationship, whether it’s with your direct report, a peer, or your own boss, using video will help to keep it strong. So many best practices for 1-1s encourage you to close your laptops and be “in the moment.” For remote teams, this simply isn’t an option. By their nature, it’s not possible for your remote video 1-1 to be a tech-free zone. But choosing a great video conferencing tool can make a big difference when it comes to eliminating distractions. My team recently made the switch from Google Meet to Zoom, and it’s made a measurable positive impact on both the technical quality of the call as well as what we’re able to discuss. Each attendee can decide which layout they prefer for video display (a Hollywood Squares-esque grid or just having the speaker on jumbotron). The big change-maker is that if you share your screen, you stay on video. This makes discussions around documents more fruitful since all participants are still on camera, and it eliminates that awkward feeling where the one person just feels oddly monitored while the other’s video is hidden. I don’t love Slack calls for 1-1s, mostly because Slack is the center of the distraction universe. Zoom has built-in chat functionality, so I make it a habit to close Slack during 1-1s and rely on that instead. And if your report has eyes bouncing all over the screen (or you can see they’re browsing Twitter by the screen reflection in their glasses, which is my favorite managerial secret), it’s a pretty sturdy indicator that they perceive the 1-1 as a waste of time. It’s on you to call attention to it and figure out how to fix it. The chances for miscommunication over video chat are higher because you’re quite literally only getting part of the picture. To avoid “What, you never told me that!” conversations in the future, make it a point to keep shared notes during your 1-1s. Google Docs is a good format for shared notes. I usually set them up by date and then use the “outline” feature to see an overview of all the meetings. For the notes themselves, just a list is fine, but make sure to mark which person is suggesting the topic. Not only does having an agenda help you keep the discussion balanced, but it can also show you trends developing over time. Has it been a couple weeks since your direct report came to the meeting with anything to talk about? It’s time to start a conversation about it, hopefully made easier by the fact the evidence is right there in front of you. Since you’ll both need to have your laptops open for a video call (and you’re definitely doing your 1-1s over video, right? ), weaving in notetaking with conversation can be pretty natural, but only if you’re using a tool that won’t prevent you from seeing the other person while you’re typing or reading the doc. It’s especially important when delivering critical feedback, setting goals, or any other exchange where an action item is communicated. It also gives instant peer review. If your report writes something that isn’t what you thought was agreed on, it’s easy to spot and correct it before a week goes by. Especially in a remote team, it’s easy for all kinds of things to be left unsaid because the “communication tax” is higher. Blocking off time for your reports on a weekly basis keeps your office door open. This applies to positive and unpleasant things alike. Having more frequent 1-1s over voice and video can reduce the overhead for quality communication and gives you insight into how your reports are doing. What might be uncomfortable or awkward to bring up over Slack can be easily detectable via facial expressions, tone of voice, and body language. It’s hard to hide emotions when you’re face to face — even if that face is on a computer screen and 2,000 miles away. When everyone’s not co-located in the same office, it’s often easy to miss out on the non-work aspects of someone’s life that impact their workday in a significant way. There’s no way to tell that your colleague is stepping away every hour to hear an update about an ailing grandparent, or that they’re really not feeling well and trying to stay at work for the sake of the team. Part of your job as a remote manager is to create a relationship where your direct report would come to you and share those details, but that won’t happen overnight. Having frequent 1-1s makes it easier to strengthen that relationship and to pick up on those nonverbal cues that lead to deeper conversations. And this “face-to-face” communication doesn’t need to stick to the confines of a 1-1. At Codeship, we use video for every call, whether it’s an all-hands meeting, sprint planning, or a project meeting. Chat conversations can turn into spontaneous 1-1s as well, and that “presence” with your team is helpful to enforce your availability and willingness to jump in to assist wherever needed. If you’re having a 1-1 with someone who isn’t operating within your normal business hours, it’s best to balance the inconvenience of working a bit outside of the normal workday. Working in the EU, I’m usually game for a meeting that goes until 7:30 pm, because I know that my US counterparts will also jump on a call at 7:30 am if they need to. Curious for more tips on remote work? Zapier has a rich guide for managing remote teams available on their site. Of course, remember that these tips might need some adaptation to work with your team. Teams are immutable human infrastructures, and each one is different!